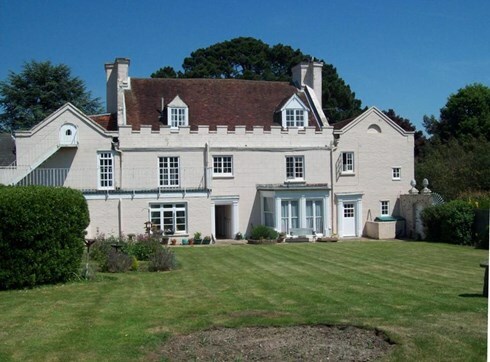 The Elms is an historic house in Old Bedhampton, near Havant, Hampshire in England. It is a Grade II ‘star’ listed building. This designation means that the owners of the building, the Manor Trust, have a specific responsibility to maintain the building in its original style, condition and fabrications, unless Planning Consent for any changes has been obtained. The Elms comprises five pleasant, characterful, self-contained apartments suitable for the independent retired active person. Please see more below. The Elms is also home to the Bedhampton Historical Collection and the Trust Office . The Waterloo Room is a Regency built Banqueting Hall and with its Gothic styled tower is an adjunct to the Elms, accessed by directly at the base of the Tower, or from within The Elms via the ante-room, the Library, now home to the ‘Secret Book Shop,’ whose secret is that it is open on function days in the Waterloo Room. The building's principal features are the 'Strawberry Hill House' style of Gothic Architecture elevations, with castellations, gothic windows, featured lionhead mouldings and the Regency Banqueting Hall, The Waterloo Room. The house was built in the 17th Century and extended and improved by the owner, Sir Theophilus Lee, in the Neo-Gothic revival style popular during the 18th Century after Prime Minister Robert Walpole’s brother built Strawberry Hill House in Twickenham (Now also belonging to a charity). Sir Theophilus commissioned a banqueting Hall that through time has become called the Waterloo Room in honour of the Duke's success at the Battle of Waterloo on June 18th, 1815. Story has it that Sir Theophilus invited his second cousin Arthur Wellesley, the first Duke of Wellington, to dine there. There is no evidence that the Duke ever dined there. Maintenance of this historic building is a significant and challenging responsibility for the charity, as it appears not to have been built with any particular long termism in mind, and the Trust continually needs the help of supporters’ donations towards this costly task for the sake of keeping the property in a fit and suitable state now and also, very importantly for future generations. Repairs and renewals all have to be carried out both externally and internally using traditional building materials unless Planning Consent for some variation has been applied for and granted. No UPVC windows are allowed! As a consequence, and this is easily imagined, any work done is costlier, more expensive than today’s works being done on more modern homes. From 2010 or thereabouts it became clear that there are many aspects of maintenance that will have to be attended to in the whole building, including the Waterloo Room and its tower. The trustees since then have developed successive ‘Asset Plans’ that over a 5 to 10-year period the necessary works can be scheduled to be carried out providing funding is available. Financial planning features largely, and provisional budgets have to be reviewed upwards as each project comes to be costed before commissioning goes ahead. In 2015 and in 2018 the trustees applied for significant grants to the Heritage Lottery Fund but without any success; such is the competition for support from that organisation. Undeterred, the trustees have committed in 2018-19 to major refurbishments works to do with renovation, repair and redecoration of the elevations, attention to outdated and unsuitable kitchen and sanitaryware, and the major issue of renewing the two large gas central heating/hot water boilers in the basement, as well as fulfilling a long-held aim to provide an all-abilities toilet for visitors. These projects are not achieved without architect’s plans being commissioned, and some Planning Consents applied for and obtained. Obviously, the work of the trustees is varied, interesting and with some challenges. The Elms offers a unique solution for someone elderly seeking security and company without compromising their independence. The Elms is in a tranquil setting with pleasant, regularly tended grounds. The building is in the centre of the village not far from the beaten track with public transport just five minutes’ walk away. There are local shops and amenities around fifteen minutes’ walk away. The Elms has five self-contained apartments, which are well suited to the independent, retired, active person. The upper floor apartments are reached by a central stairway from the entrance hall. Each apartment is centrally heated and communal areas are maintained by Trust staff. The amounts paid as residents’ contributions to the Trust include the cost of heating and hot water, the building insurance, the maintenance of the gardens as well as the cleaning of communal areas. Residents of The Elms apartments enjoy the facilities such as, furnishing their apartment with their own furniture and furnishings; they can have the use of the library (when it is not being used for other activities) and residents can visit the Library to purchase second hand books at any time from the Secret Book Shop’ by means of the ‘Honesty Box’ (most paperbacks are only £1 and purchased books can be donated back to the bookshop once read if no longer needed); and also have the use of the private gardens, which are maintained by the gardeners. Residents can also join in all the trust’s activities, the fund-raising events, either helping or just ‘visiting,’ attend the Waterloo Room Talks and other events hosted by the ‘Secret Bookshop’ and the Bedhampton Historical Collection. Sorry, currently there is no apartment available for rent in The Elms. Applicants should be single and over 60 years of age and support the aims and objectives of The Manor Trust. The appartments are refurbished from time to time with redecorations and carpet replacements. This is a collection of books held in the Library of The Elms and which are available for purchase at a very small, nominal price, for as little as £1, and if so inclined readers can donate the book back to the Secret Bookshop after reading. The Bookshop is open at the Monthly Coffee Mornings and at other events being held in the Waterloo Room. There are notices of these events on this page of the trust's website. All the money raised is put towards the work of the Manor Trust, which primarily is the upkeep of its Grade II 'Star' Listed building, The Elms and its Waterloo Room.